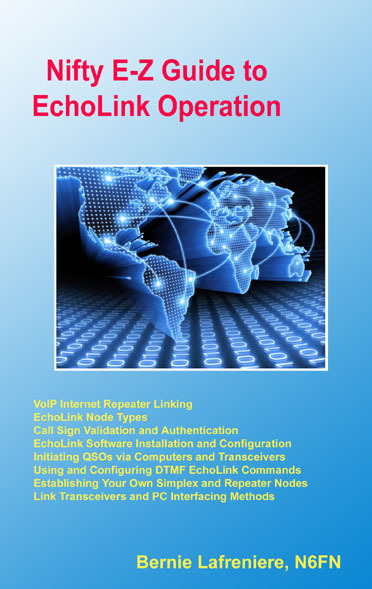 One of EchoLink's strengths is its ability to link any number of repeaters to each other, or to simplex stations. Here are some tips for setting up and configuring EchoLink to be used as a link to a local repeater. 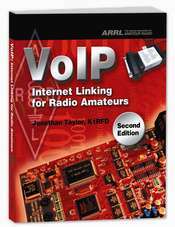 There are two ways a repeater can be connected to EchoLink. With the "hard-wired" approach, the PC on which EchoLink runs is co-located with the repeater controller, and interfaced directly to it, with no additional RF hardware. This allows positive carrier and PTT control between the repeater controller and EchoLink, and eliminates extra "hops" in the audio chain. It also eliminates the need to ID a link transmitter. One disadvantage of this technique, however, is that it requires reliable Internet access at the repeater site, which may be in a remote location. With the "remote-link" approach, an FM transceiver is connected to the EchoLink PC at a convenient location in range of the repeater, and tuned to the frequency pair of the repeater. In this configuration, the transceiver behaves very much like an ordinary local repeater user, transmitting on the repeater's input frequency (on behalf of EchoLink users) and receiving on the repeater's output frequency. Although this allows the EchoLink equipment to be placed in a more convenient location, it presents some challenges with respect to RX control. With either approach, EchoLink should be configured with a callsign with a -R suffix, to indicate that the node is a gateway to a repeater, rather than a simplex frequency. If a remote link is being used, the software should be configured to identify itself on the air with the host station's callsign, which is not necessarily the same as the EchoLink callsign (or the callsign of the repeater). Since the link itself is not a repeater, a suffix such as /R in the ID is usually not appropriate (for U.S. stations). One of the most important considerations for an EchoLink repeater node is the method of detecting the presence of a local RF signal. Although the best approach is usually to wire a COS signal into the COM port of the PC, it is often necessary (or desirable) to use VOX instead. Several techniques are described below. COS from Repeater Receiver: If the node is hard-wired to the repeater controller, the best source of carrier detect is the COS output from the repeater receiver itself -- or an equivalent signal from the repeater controller. This ensures that EchoLink transmits to the Internet only when a signal is being received on the input. Also, the audio connection to the sound card should come from the receiver's audio output, rather than the repeater transmitter's audio path. COS from Link Transceiver: If the node is remotely located, it may be desirable to use the COS signal from the link transceiver -- but only if the repeater's "tail" is extremely short. Otherwise, EchoLink will keep transmitting to the Internet 5 to 10 seconds after the local user finishes a transmission, severely interrupting the flow of a QSO. Some repeater-node operators have successfully incorporated DTMF tones in their custom Connect and Disconnect announcements to automatically shorten the repeater's "tail" while an EchoLink station is connected, on repeaters which support this type of remote command. Set the VOX threshold carefully. (This is the horizontal slider below the audio-level indicator.) The VOX threshold should be set just above the audio level of the repeater's dead carrier, so that it "trips" on voices, but not on the repeater's tail. Watch the purple SIG annunciator while adjusting the VOX threshold. Use the "Smart VOX" feature. This is enabled by checking the "Squelch Crash Anti-Trip" box on the RX Ctrl tab. When this feature is enabled, EchoLink's VOX will ignore short noise bursts, such as the repeater's courtesy tone and the squelch crash when the repeater's carrier drops. Set the time constant to a value slightly higher than the longer of these two signals. Typical settings are 250 ms for a repeater with a (short) courtesy tone, or 80 ms for a repeater with no courtesy tone. Note that the Smart VOX feature does not necessarily suppress these signals in the audio path, it merely prevents them from triggering (or holding open) the VOX. Anti-Thump: Use the Anti-Thump feature if the squelch crash, as heard over the repeater when your transceiver stops transmitting, seems to be triggering the VOX. Start with a low value and move it gradually higher until the SIG indicator no longer appears when your link stops transmitting. When the VOX is properly adjusted, the "acid test" is to connect the link to the *ECHOTEST* conference server. After hearing the initial welcome message from the test server, the repeater should drop normally and then remain idle. If the repeater continues to be keyed up by responses from the test server, re-check the above settings. When the settings are correct at both ends of a repeater-to-repeater link, both repeaters should remain idle except during an actual QSO, or while either repeater sends its ID.